I'm replacing my old power-hog home server with a new one based on the Intel D945GSEJT mainboard. 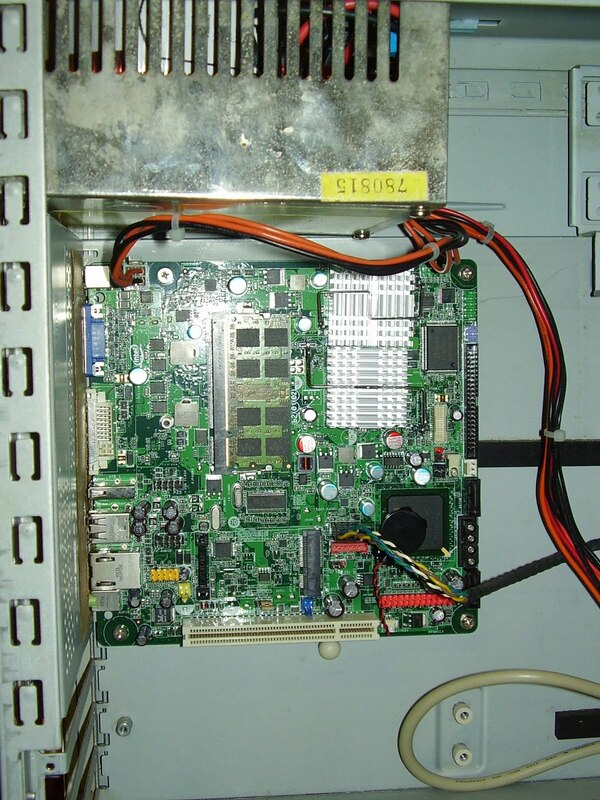 This board is essentially a netbook platform that's been "desktopified". Among it's weirder points are that it uses the Mobile 945GSE chipset, SODIMM ram, 44PIN IDE, and that it runs off a single 12V supply. The reason I chose this board is that it consumes 13W in idle and 18W under full CPU and GPU load which is pretty much the lowest power consumption one can get with an Atom system (excluding some server-specific boards that were beyond my budget). Not wanting to use an ATX PSU I've decided to build a completely new power supply for the board. Not having to bother with all the voltages needed for ATX makes this a lot easier. 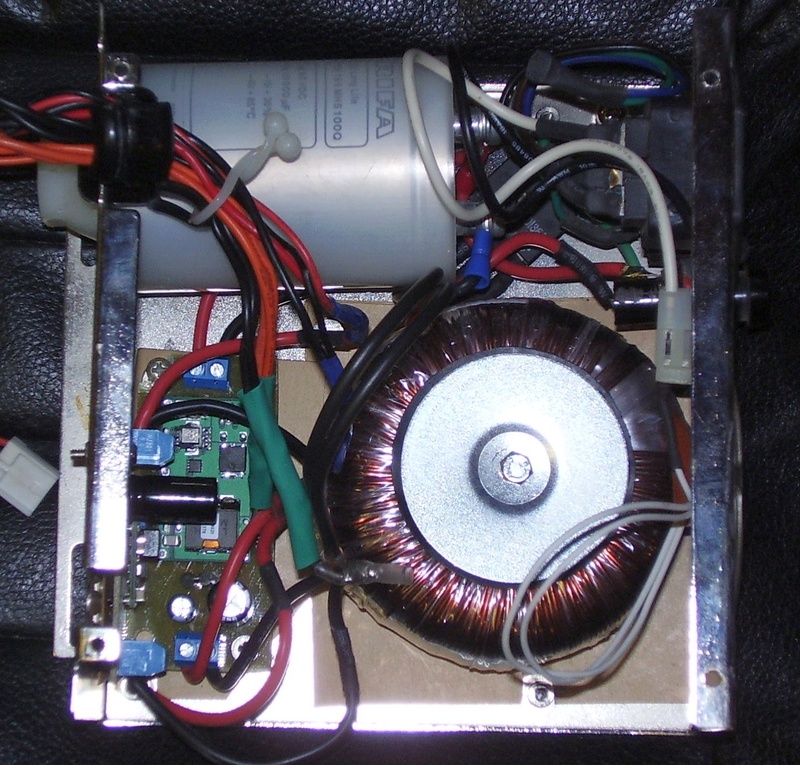 I've decided to make a high-amp 12V supply, and a 5V supply capable of driving two HDDs. I bought (actually it was a swap for some things I no longer had use for) a 100VA toroidal-core transformer to start with. 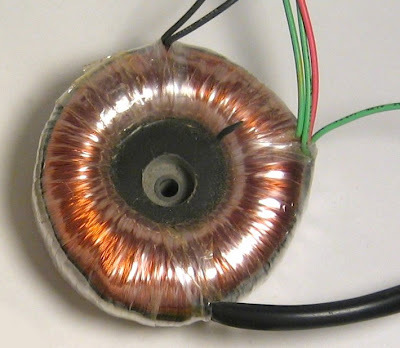 This type of transformer is widely used by audio amp builders for example as they're more efficient and take up less space than plate transformers. 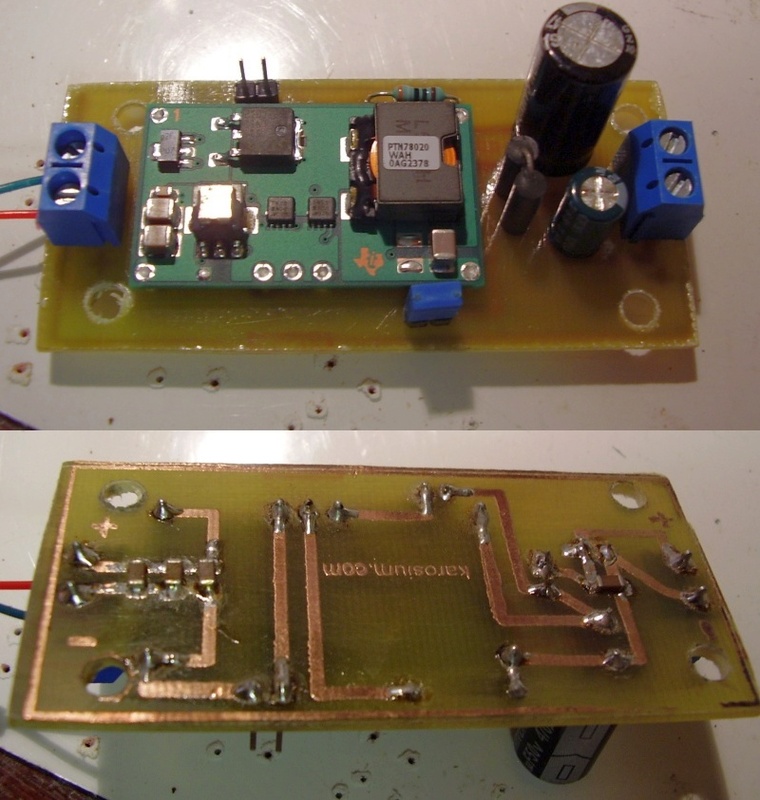 After that we have the usual bridge rectifier and smoothing capacitor combo. For the latter I'm using a single 10000uF/63V electrolytic cap, a RIFA PEH169 rated for 78000 operating hours(cca. 9 years) @85C. Since we're nowhere near the rated voltage or the temperature given for the operating hours It should probably be safe to say that this cap will outlast everything else inside the case. After rectification I get around 18Vs from this setup. For the DC regulation I decided to go with TI's power modules. 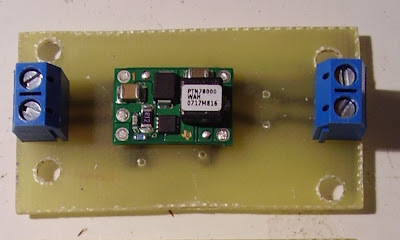 The 6Amp PTN78020 for the 12v supply, and the 1.5Amp PTN78000 for the 5V one. The 5v supply is because I don't want to run more than 1 HDD off the board's internal dc-dc power supply so I'm running a couple of molex connectors from inside the PSU for 2 more. These power modules are pretty impressive. Essentially they're complete switching regulators on a piece of PCB. You just need to add some input and output capacitors (and optional ripple filtering) and you're done. They can reach up to 96% efficiency and come in 1.5/3/6 amp versions with various protections against frying themselves and whatever it is they are powering. I went with the recommended implementation from the datasheet just adding the optional output ripple filter. 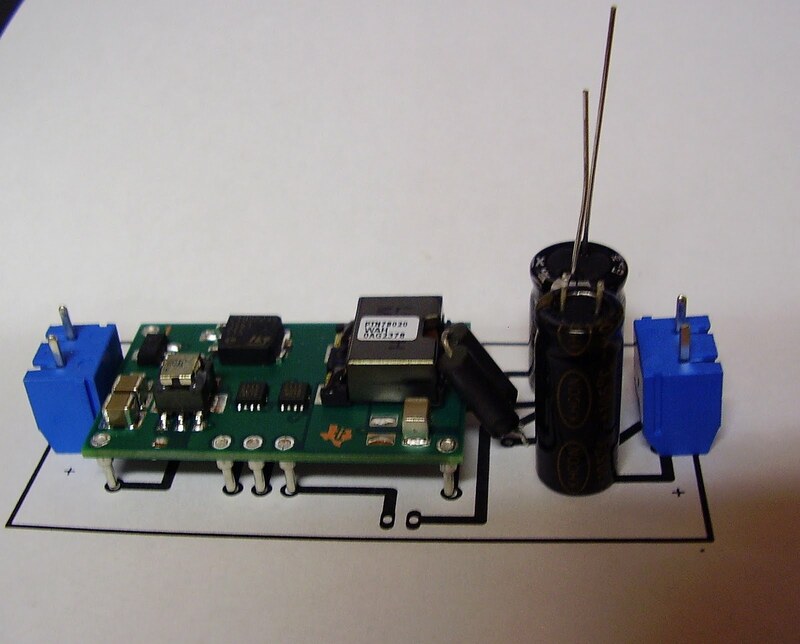 Low ESR electrolytics and 1uF SMD ceramics. The thing to the left of the caps is a double ferrite bead. I've just replaced my old server with the new one powered by this PSU. I wonder if there is an Open Source App that will read the .pro, .brd, sch files you uploaded? I couldn't find one in my Fedora 14 Repo's. I didn't look long though. I have K-Cad, KiCad, Gerbv file viewer etc... No luck with them. I was wondering what are the values of the capacitors and the other components used? And also, where did you get the transformer? The bigger caps on the modules are 470uF, the smaller one on the 12v module is 100uF both Low-ESR versions. The SMD ceramics are 1uF but only because I couldn't get bigger ones locally. The setting resistors I don't really remember but example values are given in the datasheets for common voltages. The RIFA cap is 10000uF/63V but as noted this is overkill. The transformer was wound by an acquaintance of mine. 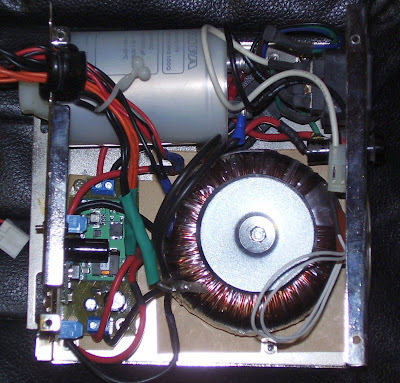 Searching on your local (especially audio-related) DIY forums should turn up a few companies where they can be bought/made to order. What are the approximate component prices? Don't really know. Reason I ended up building this is that I could get most parts for "free" or on the cheap so the whole thing didn't cost me very much. It's probably not worth building if you have to buy them all though. Better to just buy a good brand SMPS power brick instead.